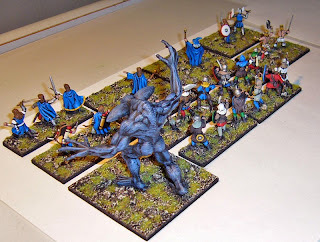 Welcome to the first post on my "Hordes of Things" blog. 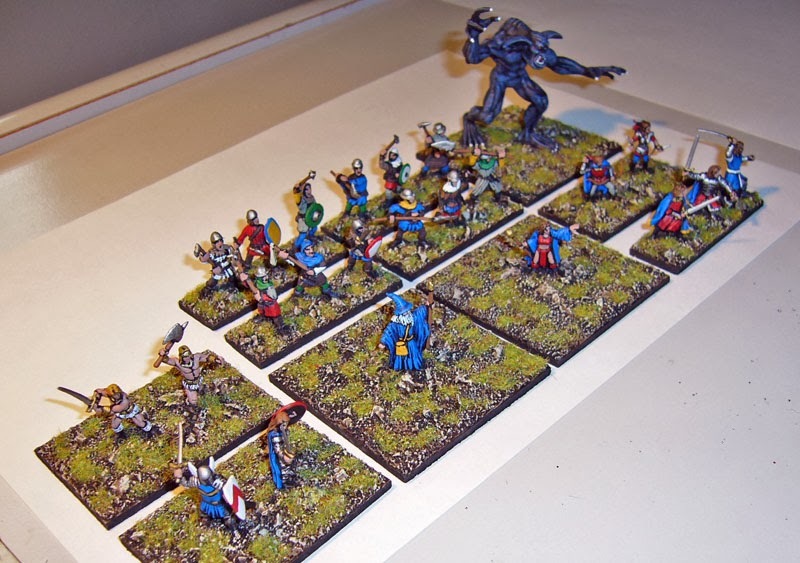 This blog will focus on various whimsical and fantastical wargaming projects, like WRG's "Horde of the Things" (HOTT) rules, Games Workshops Specialist Games "Epic" and "Battlefleet Gothic", and anything else that captures my attention. 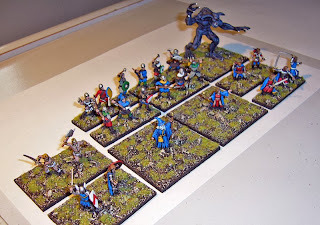 Tomorrow is our biannual HOTT tournament here in Christchurch, and I'm taking along a new army. 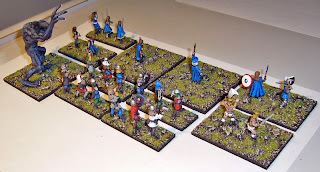 Previously I've usually borrowed from Robin's great collection of armies (see his HOTT blog here) but this time I have one of my own. HOTT is all about using your imagination, and you don't need very many figures for a standard game either. The rules are not currently in print, but a free downloadable PDF is available in the meantime. Anyway enough blathering, here's my army, done using some of the awesome variety of 1/72nd scale figures you can buy these days. Painted pretty quickly, it's 2 Wizards, 1 Blade General, 4 Blades, 1 Shooter, 1 Behemoth. There's another two elements of Heroes that I can swap in if I want (the two elements on the left). These figures are taken from the Caesar Adventurer set, with the 4 blades from the Strelets Levy set. Still heaps of figures left over from these boxes. I'm thinking about doing the rest of the levy up as Horde elements for HOTT naturally enough. 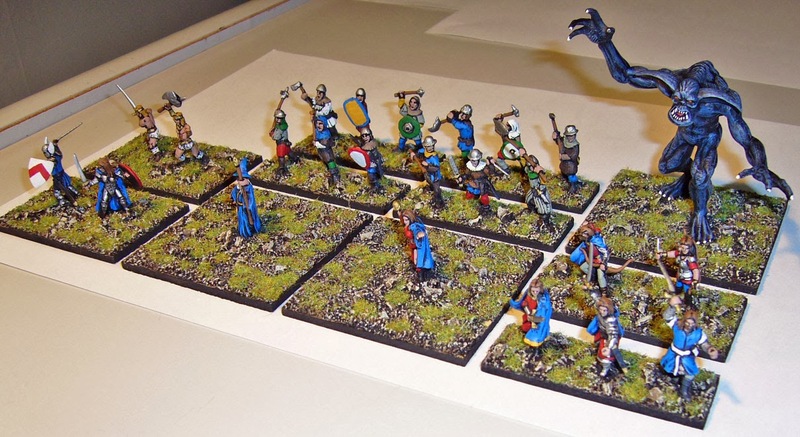 There's a review of the Strelets Levy set on the awesome Plastic Soldier Review site, not as nice as the Caeser minis but they do the job. Lastly, a dragon! 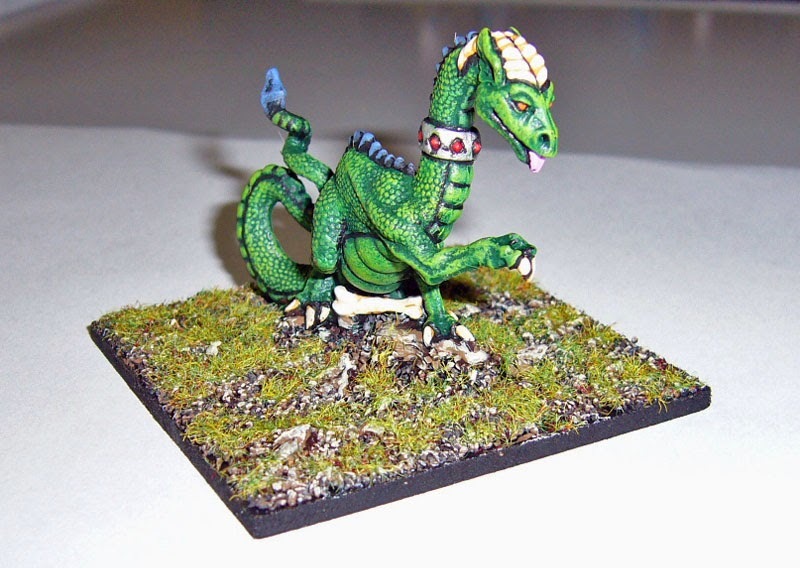 This is an old Grenadier "Pet Dragon" metal model I've had since the 80's. My Grandfather had it on his mantelpiece for years. As a kid I painted it up and gave it to him as a present, but I got it back when he died and put it into service again.